We have 42 attractive bedrooms with luxurious en-suite facilities. 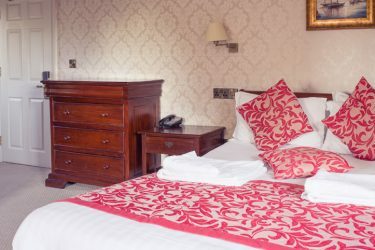 Choose from one of our 42 bedrooms, all have been lovingly restored yet still hold their former splendour of period rooms. All rooms have been refurbished but still have the unique original features with contemporary details. All our rooms have the same standards and comfort in the original house and also from our annex buildings. Spoil yourselves with our original bedroom suites, including four poster beds, designer sofas and views of the grounds and gardens. Occupying the original rooms of the Lord and Lady of the house, you will be transported and feel the unique history that surrounds your stay. The Classic Double bedrooms offer a wide range of amenities including all the four star luxuries you would expect. Fine cotton sheets, a selection of pillows, flat screen TVs and complimentary Wi-Fi internet access are among the many comforts we take pride in our guests enjoying. One bathroom is accessible with a walk-in wet room – please speak to one of our team if this is your requirement. We have a twin room within ‘The Brewhouse ‘annex building (subject to availability). Bedrooms may vary from the one displayed on website. If you have a preferred bedroom please speak to a member of our dedicated team. 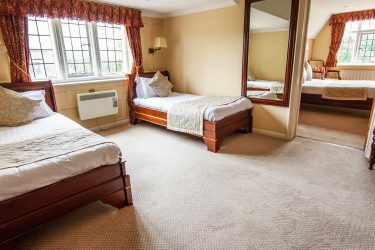 All four of our spacious and tastefully refurbished family rooms are set across both our main house and annex building. Our stunning family rooms are designed to comfortably sleep up to 4 guests at any one time. We take great pride in ensuring our guests are accommodated to the best of our ability therefore if you are travelling with small children or babies please do let a member of our team know prior to your arrival and we can allocate a room with appropriate space for cots and zed-beds. Our delightful Bridgeman Suite, dedicated to the late Lord Bridgeman. This idyllic twin room is located on the first floor of our main house with lift access. 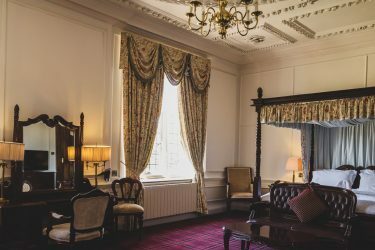 The Bridgeman Suite has recently been refurbished and is equipped with all the modern day amenities yet still houses the original features and historic character of the main house. Our breath taking Devereux Suite, dedicated to the late Sir Devereux. This is our secondary suite and is located on the first floor of our main house with lift access. After a long day, you can relax in our hand carved, solid wood, king sized bed. This stunning suite is ideal for any special occasion or treat. 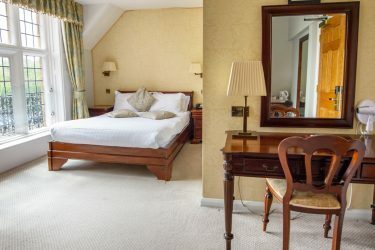 The Devereux Suite has been recently refurbished and equipped with all the modern day amenities yet still houses the original features of a fireplace, full length mirror, roll top bath and double shower and deep, rich wood décor. Our unique and romantic Bridal Suite is the perfect suite fit for the bridal party. This room once slept the late Queen herself Elizabeth 1st. Be part of this royal room and grandeur. Our state suite is situated at the top of its own grand staircase, overlooking our picturesque grounds and gardens. Relax after a long day, in our hand carved, four poster, king sized bed. This stunning suite is ideal for any special occasion or as a special treat. 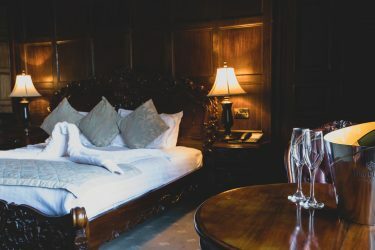 The Bridal Suite has been recently refurbished and equipped with all the modern day amenities yet still houses the original features of a fireplace, full length mirror, roll top bath and double free standing shower and deep, rich wood décor.